Cloud technologies have improved time to market (TTM), lowered operational and capital expenditures, and provided organizations with an ability to dynamically adjust provisioning to meet changing needs globally. The term "cloud" remains nebulous as cloud implementations include ever-changing technology offerings, making it difficult to discern how to optimize a cloud solution to meet your ...business needs. 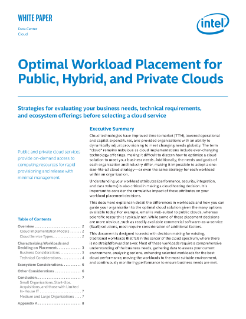 Additionally, the needs and goals of each organization and industry differ, making it impossible to adopt a one-size-fits-all cloud strategy or even the same strategy for each workload within an organization. Understanding your workload attributes (performance, security, integration, and data volume) is also critical in making a cloud hosting decision. It is important to consider the cumulative impact of these attributes on your workload placement decisions.